In her biography of Jung, Clare Dunne observes that the psychologist was convinced that human psychology was essentially religious (others would say superstitious), which became a central feature of his work. As a result, the "scientist" studied Eastern and Western philosophy, alchemy, legends, and the occult. These studies reveal the archetypes, which Jung said exist in all cultures and are collectively inherited by each of us as a birthright, perhaps "birthrite" might be more accurate. While we might doubt the concept of a "collective" unconscious," we cannot doubt that the themes and motifs identified with it are part of our cultures and infiltrate our imaginative works. This is particularly true of works based on folklore, legend, and myth. Richard Wagner's works find their inspiration in the Volk tales and legends of Medieval Europe. He, as would Jung later be, was fascinated with Eastern philosophy, knew the great Western philosophers (especially Feuerbach-who explained that man's imagination created God-- and Schopenhauer). Noting these contiguous patterns of thought and interest, no one should be surprised that Wagner's works would be rife with archetypes. A wonderful source for understanding the most commonly used archetypes is a book by Jane Garry and Hassan El-Shamy entitled Archetypes and motifs in Folklore and Literature: a Handbook, which was published in 2005 by ME Sharpe. Of course, everyone should seek out the seminal works by Maud Bodkin from the 1950s, which really introduced the serious study of archetypes in imaginative literature. The essential archetype of Wagner's Parsifal is the journey/quest. This archetype centers around a young person who leaves home in search of something which when found and returned will produce a result (positive or negative). Whatever the object of the quest might appear to be, the real object is knowledge, self knowledge; hence, this is the motif that dominates the bildungsroman or coming of age story. While Parsifal is often wrongly described as the quest for the Holy Grail, the truth of the matter is that this quest if for knowledge, knowledge that must be sacrificed for, and knowledge that will lead to salvation--the positive outcome. The apparent object of this quest is the sacred spear, but that is only a means to an end--Parsifal must first find the knowledge to value the spear and the knowledge to use it for healing and for salvation. Of course, Parsifal's "there and back again" journey does not take him full circle--he does not return to his childhood home--instead he returns to the point where he was first touched by pity, a place that Wagner complicates by placing beyond space and time--a heavenly place that has been torn by pain and strife--much like Milton's Paradise though no one has been cast out. 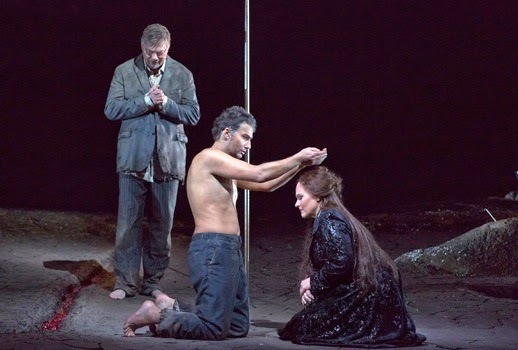 Upon Parsifal's return allows him to bring salvation to those who have suffered by applying the "benefits of of his acquisition during his sojourn and quest for treasured objects." The quote is from a general discussion of the quest motif from Garry and El-Shamey's Handbook (264), but the description fits almost too exactly. Another part of the quest motif is "learning what fear is." Unlike Siegfried, Parsifal's need to learn fear is not an overwhelming theme, since Parsifal, the pure fool or total innocent must learn everything. The archetype of the "chosen one" whose quest will fulfill some grand design infiltrates Parsifal's quest. His innocence for which he earns Gurnemanz' boot out the door is the signal that the boy is the chosen one, the one for whom the knights have been waiting.